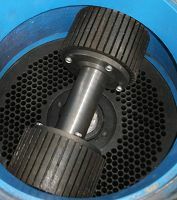 The plane grinding small pellet mill can process the oil cake and other mixed waste material to pellets form at one time. This feed & wood pellet mill can make columned granule and have slippery skin. During the process of producing granule, the temperature can almost reach 70—80 centigrade. Our feed & wood pellet press can make fecula into paste. The inner granule is cooked and fully penetrated, and not easy to go moldy and degenerative. It can be stored for a long time and improve poultry dainty and assimilation function. The pellets processed by our pellet mill for sale also can shorten the period of feeding, so our small wood pellet mill can efficiently reduce many users' productive cost. With the fast development of Wood Pellets industry, small pellet mill or pellet press becomes very popular in the world. It has the advantages of low price, low consumption, high capacity, etc. It is a good choice for small farm. And it is one kind of energy source machines which can process wood sawdust, wood lump, and any other agro-waste resource you can think of, let alone making wood pellets. 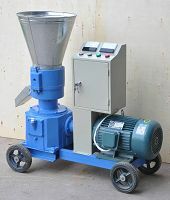 The small scale pellet mill enables you to make pellets or feed granules with your own material. The unit can be used for the granulation of sawdust, straw, biomass, paper, etc. for fuel or for the granulation of feed and fodder mixtures.With the fast development of feeding animals industry and biomass energy saving project, this kind of Flat Die Pellet mill become very popular. Since it can not only process the feedstuff for animals, such as fish, chicken, pig, etc, but also process the waste biomass material to wood pellet. The small pellet mill has a history for more than 10 years. At the beginning, it mainly used to process the pellet as feedstuff. But in recent years, people change the machine through improving the quality of main parts in the machine, in order to make it process the waste biomass materials such as sawdust, straw, etc. 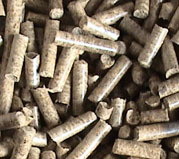 The final wood pellet can be burned as green fuel in the pellet stove or the boiler. 2) The temperature is constant about 90-95'C, you have to take over the pellet just coming out from this pellet press and cool it before touching it by hand. 1) Special raw material of the main parts such as roller, template, matrix, prolongs the life longer than other similar products in China when process wood pellet after this modification. 2) Modify the whole in the matrix to improve performance of the machines and make it easier to process products. AKG's small pellet mill, pellet mills are all of high quality. AKG is the leading wood pellet manufacturer, wood pellet producer in China. 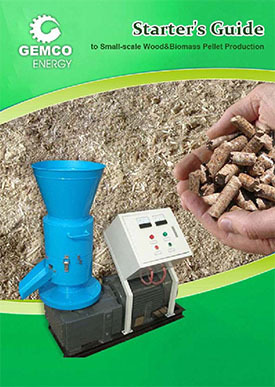 We provide high quality small pellet mill, pellet mills, wood pellets and competitive price!